The spoke brace works directly against lateral flex, helping to stabilize the wheel and reduce the amount of energy lost to flex, especially in hard sprints and steep climbs. With an aerodynamic design and weighing less than 3g for an entire set of 12, you've got nothing to lose and only speed to gain. Spoke Braces can be used on 24 spoke rear wheels. Order the 2.2mm (12pcs) for the Bracciano, Merano, Bortola, Cicilia, Revo, Lignano C50T or Gavia Volante. Order the 3.2mm (12pcs) for the Gavia (except Gavia Volante) and Vicenza. The 4.5mm (10pcs) is exclusively for the Paula. 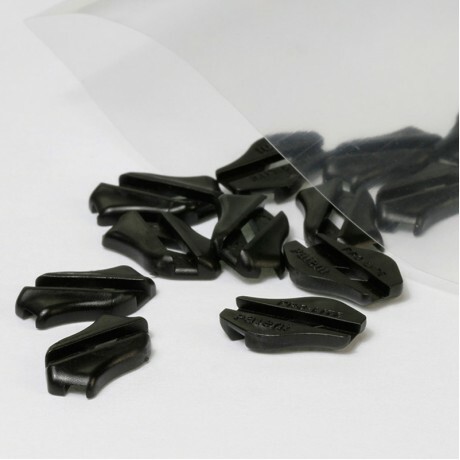 Please note that while we supply spoke braces in packs of 12, we actually include a couple of extras in case of loss or breakage. Also, some wheels have mixed lacing patterns, so spoke braces can only be used on one side. Spoke braces are included when purchasing new wheels. Spoke braces are not compatible with Como DS and Garda DS, which use a Duplex spoke pattern with different angles. Spoke braces might not fit on older Gavia wheels laced in 2-Cross, but the Gavia can be laced in 3-Cross. Spoke kits for 3-Cross can be purchased here and a lacing guide is available on request. For more information, visit this page on our main site. Spoke braces are designed specifically for Pro-Lite wheels and we make no claims about compatibility with wheels made by other brands.